These vaporizers include the Ohmeda 'Tec series (Fluotec, Pentec and Isotec/Fortec for halothane, methoxyflurane and isoflurane respectively), the Dräger Vapor 19 series, Foregger, Penlon and Ohio vaporizers. The fundamental difference between the precision vaporizer and the simple vaporizer is that the vaporizing chamber incorporates a network of internal channels and wicks which ensures that the gas emerging from the chamber is fully saturated with anesthetic vapor. The concentration of the anesthetic agent in this gas is therefore known (from its saturated vapor pressure) so, when this gas is mixed with the anesthetic-free bypass gas, the concentration of anesthetic in the gas leaving the vaporizer is also known. The proportion of the total gas flow passing through the vaporizing chamber is controlled by a dial which accurately indicates the concentration of the anesthetic delivered by the vaporizer. Minimize temperature fluctuations by heavy copper construction which acts as heat sink. Compensate for temperature changes by a valve that varies the proportion of the gas that flows through the vaporizing chamber. Tec 2 - a bimetallic strip decreases flow through the vaporizing chamber when temperature increases. Tec 3- a bimetallic strip increases flow through the bypass chamber when temperature increases. Ohio 100 - a bellows and thimble valve increases flow through the bypass when temperature increases. Dräger 19 - an annular valve constructed of dissimilar metals increases flow through the bypass when temperature increases. Different designs of vaporizer vary in their ability to deliver accurate concentrations of anesthetic at different fresh gas flow rates. The following graphs demonstrate the accuracy of various halothane vaporizers, but those designed for other agents are generally similar in performance. Fluotec 2 - Very inaccurate at low flows, but good for flow rates greater than 5 l/min. Fluotec 3 - Accuracy tends to fall off at high dial setting and flow rates. Ohio 100 - Output increases at high flow rates and vice versa. Dräger 19 - Very accurate at all dial settings over a wide range of flow rates. The major problem presented by desflurane is that it is extremely volatile: at 22.8oC, its boiling point is only slightly above normal room temperature, which precludes the use of a normal variable-bypass type vaporizer. The Tec 6 vaporizer avoids this problem by heating the desflurane liquid to above its boiling point in a sealed chamber and mixing pure desflurane gas with the carrier gas. The desflurane liquid is heated to 39oC by a heating element (H) at which temperature its SVP is approximately 1300 mmHg. The carrier gas flow is restricted by an orifice (O) so that the pressure of the carrier gas within the vaporizer is proportional to gas flow. This pressure is sensed by a differential pressure transducer (P) which adjusts a resistor (R1) so that the flow of desflurane out of the vaporizing chamber is proportional to the carrier gas flow. This enables the output concentration to be made independent of carrier gas flow rate. The control dial adjusts a second resistor (R2) which controls the output of desflurane gas, and thus the output concentration. The Tec 6 is electrically powered and electronically controlled and so requires a mains power supply. Another complication is that, since the vaporizing chamber is sealed from the atmopshere, a special filler arrangement is required. Although desflurane has many desirable properties, the very considerable expense of the vaporizer has led to little use of this agent in veterinary practice. Precision vaporizers can provide a highly accurate output of anesthetic which, over a wide range, is independent of time, gas flow rate and temperature. They are, however, heavy, expensive and require regular servicing if their accuracy is to be maintained. Precision vaporizers are built for use with a specific agent and can be lethal if the wrong agent is used (e.g. a Pentec, designed for use with methoxyflurane, filled with halothane would deliver over 30% halothane when full on). Their high internal resistance prevents them from being used in the breathing circuit. Vaporizers may be filled by a conventional funnel-fill mechanism, in which the liquid anesthetic is simply poured into a funnel in the vaporizer. The problem with this method is that, if more than one anesthetic is used in a facility, there is nothing to prevent the vaporizer being filled with the wrong agent. This may be prevented with the use of a key-filler system. 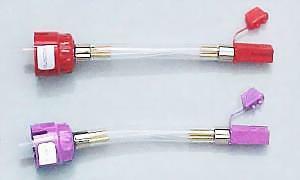 In this system, an agent-specific filler tube is used, one end of which slots into a fitting on the vaporizer, and the other end slots into a collar on the bottle of anesthetic. The fitting on the vaporizer and the collar on the bottle are specific to each agent, making it impossible (or, at least, extremely difficult) to fill the vaporizer with the wrong agent. It is often desirable to mount several vaporizers in series on the same machine so that different anesthetics may be administered when desired. However, this arrangement presents the hazard that, if more than one vaporizer can be switched on at a time, the patient may be exposed to a relative overdose of anesthetic agent. 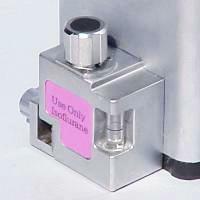 In addition, the downstream vaporizer will become contaminated with the anesthetic contained in the upstream vaporizer. If this occurs and, for example, halothane in the upstream vaporizer contaminates the methoxyflurane contained in the downstream vaporizer, the methoxyflurane vaporizer will deliver a high concentration of halothane when it was next used because of the higher volatility of this agent. A single dismountable vaporizer may be fitted which is removed from the machine and replaced when another agent is to be used. 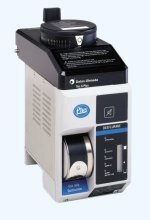 This has the added advantage that only one vaporizer for an infrequently used agent need be purchased for use on several machines. However, there is always the possibility of a vaporizer being dropped and, in many vaporizers, liquid anesthetic may drain into the gas outlet and be driven into the patient circuit if the vaporizer is tipped or inverted while it is being carried. Newer vaporizers, such as the 'Tec 5 series and Dräger 2000, are designed to prevent this happening. The vaporizers may be arranged so that the vaporizer to be used is connected to the circuit using flexible hose and 23 mm adapters and disconnected when not in use. This is often the most convenient method on pole-mount anesthesia machines. A switch on the back bar may be used to direct gas flow through only one vaporizer at a time, e.g. the Fraser Harlake Selectatec back bar and the Vapor changeover switch used with Dräger 19.1 vaporizers. Two Tec 4 vaporizers mounted on a Fraser Harlake selector back bar. 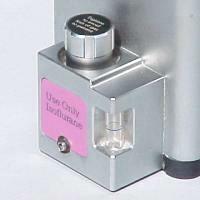 The vaporizer in use is selected by the switch located between the vaporizers on the back bar. A mechanical locking system may be used that only allows one vaporizer to be switched on, e.g. Ohio selector manifolds and Dräger 19.3 vaporizers. The Ohio triple selector manifold allows the left, center or right vaporizer to be used. Slots in the selector (arrowed) line up with flanges on the vaporizer control dials. A mechanical inter-connector may be used to prevent more than one vaporizer being switched on at a time, e.g. 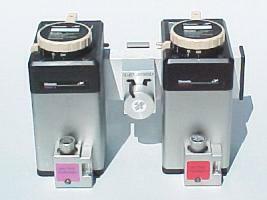 the Ohmeda Selectatec system and Dräger 19.2 vaporizers. 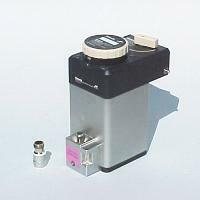 Ohmeda Selectatec vaporizers incorporate pins in the manifold that are linked to the control dial. When one vaporizer is in use, the pins extend and prevent other vaporizers being switched on. 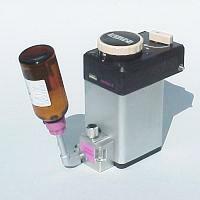 The Dräger Interlock 1 system for Vapor 19.2 vaporizers features a rotating bar on the manifold with teeth that fit into a cut-out on the back of the control dial. This will, of course, do nothing to prevent the patient being inadvertently exposed to more than one anesthetic at a time. All pages © Anesthesia Service and Equipment 1998-2003.